It's March again, and you know what this means: No, not spring or nice weather (at least, not for those of us that live in the Midwest... not quite). No. Actually, I'm talking about brackets. College basketball, of course. This year, we here on The Sad Bear are doing something for it, and we want you readers to challenge us. This isn't because we think we're smarter than you. In fact, most of us probably aren't. I, for example, am picking that team wearing green to go to the Sweet Sixteen despite the fact that Sparty has had a terrible, underachieving season this year and can't hang on to the damn basketball. Chase is working on the misguided notion that Kentucky is going to beat Ohio State and go to the final four. I'm sure Mark has been dreaming about Arizona winning the the national championship even before he found out that they were a No. 5 seed. In other words, we're mostly homers. But we still like basketball (most of us) and even when our team gets upset in the first round we still love watching every single game. So, if you think you can beat us, join our group on the NCAA's "official bracket challenge" (trademark, probably). Even if you don't think you can beat us (you probably will) and know nothing about basketball (really, you have a good chance), you're invited. Send me an email at jackhitts [at] gmail [dot] com by Tuesday and I will officially invite you to the group. I'm really rooting for Akron and my bracket says so. I initially put all four Pac-10 teams in the Sweet Sixteen. That seemed... unseemly... So now it's just two. Sean Miller's taking the (Arizona) Wildcats to Houston! Final Four! Mark it down! 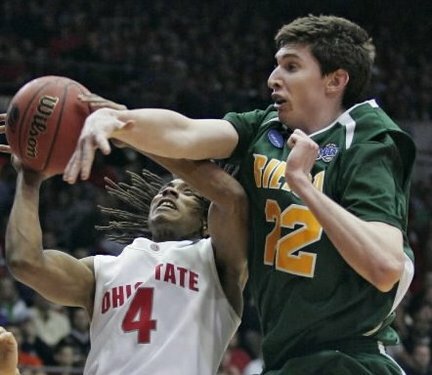 I still feel miffed that Siena College and Ryan Rossiter didn't make it this time around. Boo. I think this is only my second bracket ever. The first was scribbled out in my youth on a Chicago Sun-Times bracket. And for some reason, this reminds me of another nerdy sports thing I did at like age 12: I took a map of the Chicago suburbs and colored in the cities based on how good their youth baseball teams were, hoping to find some sort of geographical trend. I'm choosing teams based on mascot and whether or not I've heard of them. Wait, so, basketball is the one with the puck and the L-shaped sticks, right? I think that our children will be really into sports. Let's go ahead and name our future-daughter Butch right now. I would actually like to get more into sports. Can you teach me, Maggie?